Opening June 12, 2010 from 6-9 pm. On view from June 12-June 26, 2010. 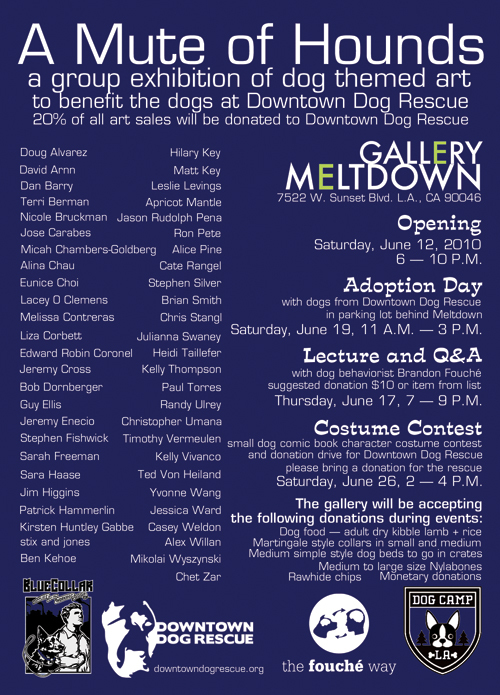 Gallery Meltdown is very excited to present “A Mute of Hounds”, a show of dog inspired art work by 50 amazing artists, to benefit the dogs of Downtown Dog Rescue. 20% of all sales of artwork will be donated to Downtown Dog Rescue. The Downtown Dog Rescue (DDR) is the only program in California, and possibly the United States, specifically founded to assist homeless dog owners spay/neuter, vaccinate, license their dogs, as well as offer a variety of services including crisis care for the life of the dog. Each year Downtown Dog Rescue assists in rescuing over 300 dogs, mostly American Pit bull Terriers and other Power Breeds that often die in the shelters mostly due to unresolved behavioral issues. Each dog we rescue is socialized with other dogs, evaluated for aggression, sterilized, vaccinated and micro-chipped before the dog is adopted out. We administer innovative programs in various communities in Los Angeles to promote responsible pet ownership, empower individuals to become pet welfare advocates and provide opportunities for compassionate dog lovers (friends, volunteers and donors) to make a difference in the lives of people and “downtown” dogs. In this 1 hour 30 minute seminar followed by a 30 minute Q & A.Brandon Fouche will explain the basics of “The Fouche Way” and how it applies to aggression, leash-pulling, and becoming alpha. Brandon has saved the lives of hundreds of dogs by taking “hopeless cases” from city shelters and turning them into loving adoptable dogs. Brandon is proud to be the dog behaviorist and rehabilitator for the major rescue organizations in LA and surrounding areas. Brandon believes that his proven and effective method of communicating and connecting with dogs can be practiced by anyone. For further information on Brandon Fouche and The Fouche Way, please visit his website http://brandonfouche.com Please DO NOT bring your dog, this time. Please DO bring a donation for the dogs. Saturday, June 26th 2-4 p.m.